This month has gone really quickly, I say this every month, but it really has. Summer is pretty much over and we are well on the route to Christmas, yikes! I’m pretty excited for September though, I’ve got a trip to Paris coming up, some exciting events and a really exciting secret project I’m working on with a brand that I cannot wait to share with you! This months’ five things, are mainly beauty based. I do get sent and buy a lot of beauty products and I genuinely get excited about that, sorry not sorry. If there was something that summed up happiness for me, it’s probably a big pile of glitter. I’m obsessed, if it’s glittery I have got to have it. Yes it’s girly and it’s pink and full of stars, goodness me, but I LOVE it. I have had several mobile cases for my iPhone but nothing just felt quite right and I love this one as it’s clear you can still see the rose gold colour of the phone. All my other cases blocked this out that I wondered why I bothered deliberately over what colour iPhone 6 to get. Now you can see it and I love how the glitter runs over it, hours of fun, for me anyway. I got mine in store at Topshop but can you buy them online at ASOS & also Skinny Dip London’s own site. I have been using MAC’s Mineralize Skinfinish Foundation for quite a long time now and I was happy with it. 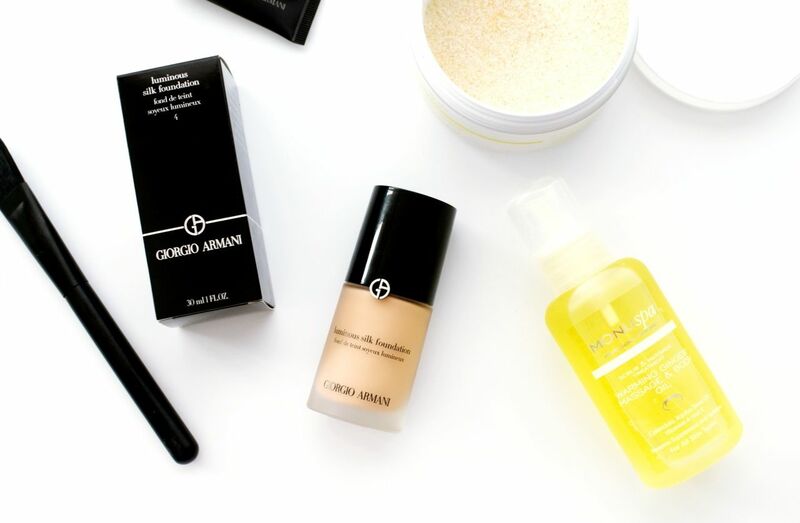 But when I saw reviews of the Armani Luminous Foundation on various blogger YouTube channels, I was just blown away and intrigued by the completely flawless finish. I did start to feel like my MAC was becoming slightly darker in colour than I liked and was appearing a little patchy because of that, so I took the plunge, headed to Selfridges and got colour matched at Armani. I am so happy with the colour and the foundation that I will do a review very soon. I had never heard of MONU spa until recently and was kindly sent some products to try out. I absolutely loved them the minute I smelt them, they smell like you have been whisked off to a spa for the weekend. The warming ginger massage and body oil was my favourite, it has jojoba seed oil, vitamins A & E and calendula in it, so it’s very nourishing on the skin, which is just what I need. I liked this oil as when you applied it, it didn’t leave you feeling sticky or waiting around for it to dry in, it just did. I used it as suggested and rubbed it in whilst still in the shower which was a great way to use it. It warms in your hands and feels lovely on. You can also add it to the Monu spa bath salts to make a scrub, I haven’t done this but have used the papaya balt salts in my bath and they smell like utter bliss. Another great choice for nourishing the skin and also the oat flour can calm any skin irritations as well. I also recommend the enriched body cream, it has the smoothest feel, has rose essential oils, vitamins A, E and B5 and marine collagen to help smooth and firm. Who needs the spa with these at home? Ok so you might have seen I am off to Paris next month, which is pretty exciting. Danny and I are off for a weekend, so any suggestions are welcome. I’ve had so many of you suggest lots of great places already so I am really excited to go and visit them. I’ve only ever been to Paris in a day, so this will be a great chance to explore the City a little more. I’m also going to be doing an Instagram takeover for the hotel we are staying at so look out for more details on that very soon and you can follow our journey in Paris. How do you fancy taking a little bit of Fortnum & Mason home with you? 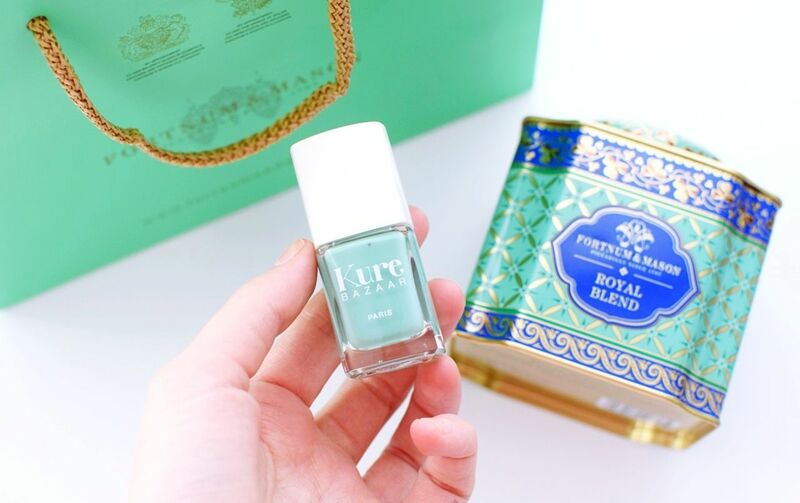 Kure Bazaar have teamed up with Fortnum’s on this exclusive nail colour entitled ‘Nile’. The colour is the iconic ‘Eau de Nil’ which is a light green. The lacquer has an 85% natural formula (potatoes, cotton, wood pulp, wheat and corn), has an ultra shine and quick drying results. They very kindly sent me it over to try and also with some gorgeous Fortum & Mason tea. There goes my Sunday sorted. The polish is priced at £15 and available at Fortum & Mason beauty hall and online at www.fortnumandmason.com.